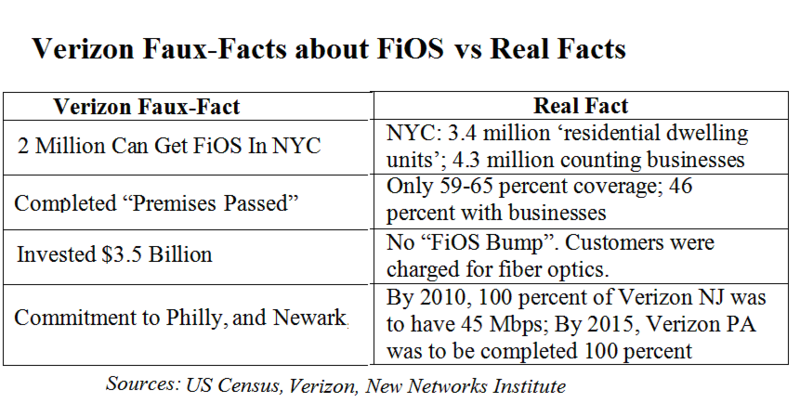 Verizon's Memo to Staff About FiOS: "Trust the Facts." What About the Truth? Click for Verizon's "Trust the Facts". Verizon created "Trust the Facts", a fact sheet and talking points for the Verizon staff. It appears to be based on statements made by senior management, including Verizon's testimony presented at a recent New York City Council meeting which is investigating Verizon's NYC FiOS cable deployment and franchise agreement. The memo attempts to supply information that sounds almost plausible, but it is just filled with faux-facts and partial truths. Moreover, in the memo, Verizon tells the staff to accuse the press of being inaccurate. "Recently, there have been inaccurate statements in the press about our FiOS build. The information below will help you understand the reality of our success and ongoing commitment to FiOS." Let's address some of these 'faux-facts' with actual facts. "Over 2 million customers can get FiOS service now (in New York City) and that number grows every day." "We completed our prems (premises) passed requirement in October of 2014." "We passed all prems, in all five boroughs of NYC." "In New York City, we've invested $3.5 billion in FiOS." "Our commitment to other cities such as Philadelphia, Newark, Paterson, Pittsburgh and Washington DC is equally strong." Note: "Prems" is slang for 'premises', i.e. the home or business that is supposed to be upgraded. Verizon has completed only 46-65 percent of their FiOS cable franchise commitment in New York City. No. Verizon did not complete anything. The requirement, written into the agreement, is to have 100 percent -- "available to ALL residential dwelling units". Verizon never invested an additional $3.5 billion on FiOS. The fiber optic deployments came out of normal utility construction and maintenance budgets -- and paid for, in a large part, by local phone customers via multiple rate increases. Verizon failed to upgrade Pennsylvania and New Jersey based on previous commitments to fiber-ize the states. By 2010, 100% of Verizon New Jersey should have had a fiber optic service capable of 45Mbps in both directions, and in Pennsylvania, Verizon was to have 100% completed by 2015. In both states, laws were changed to fund these networks via rate increases and tax perks. Let's go through some of the details. VERIZON: "Over 2 million customers can get FiOS service now and that number grows every day." FACT: By the end of July 2014, Verizon NY was supposed to have completed 100 percent coverage of New York City's residential dwelling units, based on a franchise agreement signed in 2008. This is a chart built from US Census data pertaining to New York City. The Census has specific meanings for the words 'households', and 'residential housing (dwelling) units', and there are a few different definitions that slice up the common term 'business', as well. Turning to another quote, Verizon's Leecia Eve, vice president (State Government Affairs for the NJ, NY & CT region), testified in front of the New York City Council, and Ms. Eve used the term 'households'. "We have 2 million households than can request FiOS today and get installed tomorrow." Notice the word 'household' because another term, 'residential dwelling units', is used in the NYC FiOS franchise agreement and the accounting is actually different based on the Census definitions. 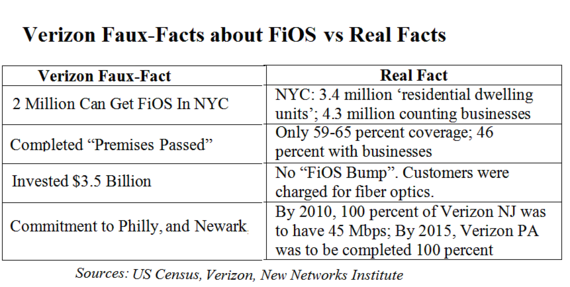 PUBLIC FACT: Only 46-65 Percent of New York City's Residential Housing Units and Businesses Can Get FiOS. Using this last quote, if Verizon claims it has 2 million households covered, there's a serious problem. Returning to the chart, the Census data shows there are 3.1 million households (homes) in New York City. However, there are 3.4 million 'residential dwelling units' and 4.3 million 'housing units and businesses' in the Big Apple. PUBLIC FACT: Verizon's FiOS Cable Franchise Is for All Residential (Housing) Dwelling Units. The numbers to use in evaluating Verizon's coverage should be based on the actual New York City FiOS franchise agreement language which focuses on 'residential dwelling units'. Thus, Verizon's NYC FiOS deployments should cover 3.4 million residential dwelling units, not 2 million households in order to be 'completed'. We need to also stress that Verizon was able to get out of doing commercial spaces in New York City, so businesses are not properly serviced. This means that if we examine "residential dwelling units and businesses", the actual coverage drops to around 46 percent of the City. Most people are unaware of this important caveat. PUBLIC FACT: Verizon Claims That They Have Passed All "Prems": They Have Not. "We completed our prems passed requirement in October of 2014." "Verizon: We passed all prems, in all five boroughs of NYC." The term of the contract is for 100 percent of "all residential dwelling units" to have the service 'available'. Period. "Prems-passed" is hand waiving to obfuscate the primary issue -- Verizon has only 46-65 percent done, depending on which metric you rely on, and therefore Verizon isn't even close to finishing New York City. PUBLIC FACT: Verizon New York Did Not Invest $3.5 Billion in New York City. PUBLIC FACT: There are at Least Five Things Wrong with this Statement. In 2005, Verizon convinced the NY State Public Service Commission (NYPSC) that the fiber optic wires that the FiOS services ride over are part of the state telecommunications utility, which gave them the utility rights-of-way and the ability to use the local utility construction budgets. Starting in 2006, Verizon got the NYPSC to agree to a series of rate increases on basic local service for the "massive deployment of fiber optics". From 2006 through 2014, local phone customers paid over $760.00, total, per line extra for basic service based on the changes in state regulation for this deployment. Customers who paid these rate increases, including low income families, seniors, or just basic residential customers, may never get upgraded. There is no sign of this $3.5 billion investment in the construction budgets. There was no extra 'bump' in new construction. PUBLIC FACT: Verizon Investors Didn't Invest Most of the Money. Customers Were Charged Rate Increases of Over $760.00. In 2006, Verizon cut a deal with the NY State Public Service Commission to raise local phone rates, and this was repeated multiple times. By the 2009, local phone customers had been hit with 84 percent rate increases to fund a "massive deployment of fiber optics". These increases on just basic phone service added about $760 per line, (including taxes, fees and surcharges) in New York City if the customer had service since 2006, or a fraction of this excess as everyone who had service during 2006-2015 got hit with these rate increases. Also, each add-on service, from inside wire maintenance to nonpublished numbers, all had increases of 100-300 percent, adding hundred of dollars extra per additional service. PUBLIC FACT: There Is No Sign of This $3.5 Billion Investment in the Construction Budgets. Spending $3.5 billion for FiOS in New York City sounds great in the aggregate but it doesn't exist; it came out of the utility construction budgets that low income families, grandma, business and all phone customers paid for if they had basic local phone service. This next chart supplies Verizon NY's construction expenditures for the FiOS years, 2008-2014, taken from Verizon NY's own financial reports. As that old commercial goes: "Where's the Beef?" Verizon claims to have spent $3.5 billion over seven years, about $½ billion a year. However, if you look at this chart, there is NO extra financial spending. The "FiOS Bump Missing" is what should have been added to the Verizon New York construction expenses if this was new, additional funding for FiOS. The fact is, the construction budgets for the NYC FiOS franchise were just pulled directly out of the normal 'business as usual' construction budgets for the state utility's upgrade and maintenance. The $3.5 billion spent against the average, $27.5 billion in revenues, is only 12.7 percent or chump change for a major build out. In the previous decades from 1984-2000, construction expenses would average 18-22 percent of revenues. 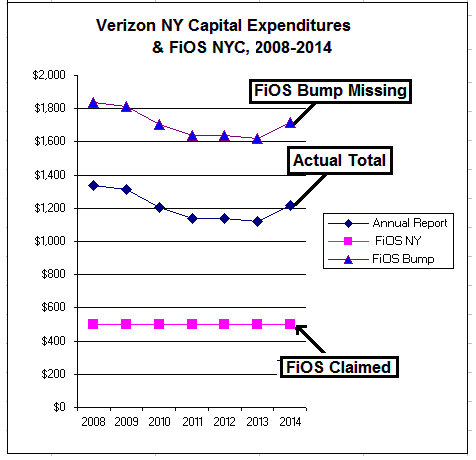 We are not arguing that Verizon didn't spend money on FiOS in New York City. The problem is--it's not 'new' or additional investment, just a restatement of monies that would have already been spent on network upgrades and maintenance. And we are not arguing that the aging copper networks shouldn't be replaced with fiber optics. The problem is -- you can't charge utility phone customers hundreds of dollars for the creation of a cable service or charge them for fiber optic upgrades when they may never get upgraded. PUBLIC FACT: This Is a Joke, Right? Philadelphia and Pittsburgh were supposed to have fiber optic broadband starting in 1996, as then-Bell Atlantic went to the Pennsylvania Public Service Commission and made an agreement to wire the entire Verizon state territory by 2015. And this was happening, in varying degrees, in every Verizon East Coast state. This 1996 Bell Atlantic (Verizon) press release claims that it was going to wire 12 million homes and small businesses with fiber optics, starting in Philly--starting almost 20 years ago. "Later this year, Bell Atlantic will begin installing fiber-optic facilities and electronics to replace the predominantly copper cables between its telephone switching offices and customers...Bell Atlantic plans to begin its network upgrade in Philadelphia and southeastern Pennsylvania later this year. The company plans to expand this Full Service Network deployment to other key markets over the next three years. Ultimately, Bell Atlantic expects to serve most of the 12 million homes and small businesses across the mid-Atlantic region with switched broadband networks." To update this, in 2014, Verizon was able to get the New Jersey Board of Public Utilities to erase the laws and commitments via a stipulation agreement so that Verizon would be able to stop the fiber optic build out, and instead replace the commitment with wireless at slower DSL speeds. DSL is a limited broadband-Internet service that uses the old copper wires. Verizon New Jersey's commitment is for 45Mbps in both directions and as of 2015, the NJ consumer advocate's office (Rate Counsel) has filed an appeal to stop the stipulation agreement and return to the commitments. But the kicker--in both states, laws were changed to raise rates and give the company tax perks to fund this new construction, and neither State government went back to either get a refund or do the actual build outs. Instead, the increases were built into rates and we estimate that starting around 1993-1994 through 2014, customers paid an estimated $4,000-$5,000 per household, extra. We estimate that Verizon, in New Jersey and Pennsylvania, respectively, received $15-$18 billion extra for these build outs -- and counting. And the irony is -- Verizon's claims a strong commitment to a few cities -- but the previous fiber optic deployment commitments were for the entire state territory, including rural areas. Can you imagine if Verizon had actually been held accountable for this fiber optic future over the last two decades -- or told the truth about their deployment plans? For full documentation see: The Book of Broken Promises .